On August 15, 2018, I will be celebrating 10 years of iWebU - that's over 500 weekly posts . Leading up to that momentous date, I am re-releasing the "best of iWebU", starting in 2008. And so, I revisit Web Secret #141: Dunbar's Number. Why? In 1992, British anthropologist Robin Dunbar hypothesized that there is a cognitive limit to the number of people with whom one can maintain stable social relationships. By stable, he meant relationships in which an individual knows who each person is, and how each person relates to every other person. Though Dunbar did not assign a precise value to the number, (it lies between 100 and 230), the commonly used value is 150. So 150 is referred to as Dunbar's Number. 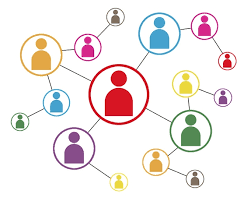 In my presentations on social media for mental health and EAP providers, I always refer to Dunbar's number because the implication for professionals is that a handful of key colleagues are usually more instrumental in getting referrals, speaking gigs, or even a new job, than hundreds of random "friends.". True in 2011, true in 2018. Web Secret #141: Dunbar's Number - February 16, 2011 In all of my presentations about social media, I emphasize that the quality of one's friends, followers, readers, etc. is far more important than the number.